Horseshoes are a classic symbol of the Wild West, games, and luck. Apart from throwing them at a pole, they also have many other uses you might have not even considered, particularly great horseshoe crafts. Their sturdy and unique design make them perfect for so many different craft ideas. Horseshoes make great picture frames, key holders, and even benches. They also make great home decorations. There are so many ways to get creative with horseshoes. You can probably come up with a few ideas yourself! If you want to try your luck with horseshoe crafts, check out our list! We have listed 31 amazing and even sometimes simple horseshoe projects that you can make yourself. You can actually buy horseshoes at the craft store, so they are made for crafts like these! Check out these pictures and see if you find something you want to try. Even if you do not want to try one, just enjoy the beauty of these crafts. Which of these horseshoe crafts is your favorite? 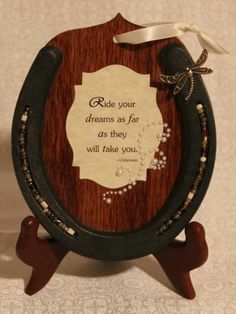 Make a special plaque with a quote out of a horseshoe. This one is mantle worthy! Horseshoes are known for their luck. This sign is a great decorative piece! Set your drinks down in the yard with this nifty design. This dream catcher is perfect to hang up in your home. Who knew that horseshoes make such great jewelry holders? Prominently display your candles with this DIY project! This bench took some work, but it was worth it! Keep all of your keys in one place with this horseshoe craft. Absolutely awesome! Holds your favorite wine bottles. Spread the love with this beautiful horse shoe heart! This coaster is so nice you may not want to use it. Sounds simple enough! Turn a horseshoe into a TP holder. Decorate your front door with this year round wreath. A great way to display your favorite wine! There is no better looking boot rack out there! Horse shoes can be turned into a salt and pepper holder. This one even holds napkins in the middle! You can decorate your mirror with horse shoes to make it more rustic. Keep all of your magazines organized with this simple DIY craft. This simple project can really add a unique look to your bathroom. Switching out handles for horseshoes is an easy, yet stylish renovation project. A fun craft for your or the kids. Also a great art piece for the house! This is a great way to display your favorite pictures. Wouldn’t this be a great display for Christmas? A great way to organize your bathroom in a fun way! Decorate your front door and make it rustic with a horseshoe door knocker. It also has room for a custom message. Such a great and fashionable way to keep your shelves organized. Horseshoes are very sturdy and make great crate handles. This decoration is great for the home. Spread the love! Make this if you want to add a western flair to your home. If you have the time and the skill, try your luck with this beauty! Decorate a horseshoe any way you want and hang it up! Have you attempted any horseshoe crafts? Please share in the comments below! Not enough DIY home ideas for you? View the Craft page for more!